I mean, I can barely keep the simple ones. Things like, calling someone back, returning an email, or even promising my husband I'm going to shave my legs WAY more often than I do. I PROMISE i'll email you back! Ok, let's get back to business shall we! And I made a promise that this wouldn't take forever. So today we are going to focus on the little tykes...And tomorrow (or the next day...don't hate) we will get into toddler food. Sound good?! Ok!! I remember when it came time to get Baby Boo ready for solid foods, I couldn't help but feel nervous. I know, sounds crazy, but I was just so happy nursing her that I didn't want to really add any thing else that might make things more difficult. It was a little after Baby Boo had turned 4 months that a lot of people told me I should start feeding her rice cereal. I was indifferent because my doctor, as well as many books I had read, had said to wait till 6 months. But of coarse I gave into peer pressure and tried introducing rice cereal to her early on, and it was hell. Not only did I soon learn she wasn't ready, but it stressed me out because I was constantly worried and trying to force her to eat. Every meal time was a struggle, and she would cry every time we would sit her in her high chair. Soon after, she stopped breastfeeding (also because people told me I should introduce a bottle) and she was refusing any type of solids. Time after time I was listening to other people's advice and comments, and not my own (and my doctor's) instincts and recommendations...In the end, it didn't work out the way I had hoped. How has this had an impact on Baby Boo's eating habits now? Call me crazy, but I truly believe that I kind of messed things up in the beginning. If there has one thing I have learned about being Baby Boo's mom, it's that when she is ready to do something she will do it...And when she isn't, she won't. In my heart, I truly felt that it was too early to start feeding Baby Boo solids, and that she wasn't ready. Sometimes I think if I would have waited a little longer and took a slower approach that it would have been easier, and not as stressful, for her to eat. So, when is the best time to start? Every child is different. 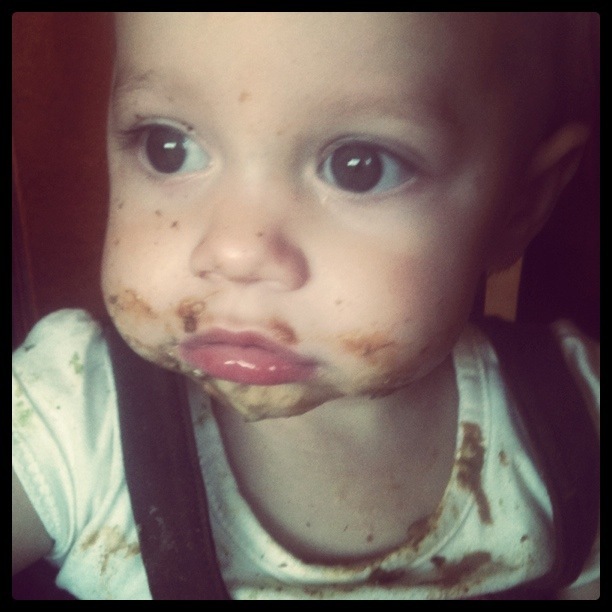 Some children may do well trying solids earlier than other babies, but do what you feel is best. Listen to your doctors advice first and foremost. Next, listen to your motherly instinct. If you feel your baby isn't ready, don't force it. Take it slow and don't stress it. Even if you only introduce foods every so often, eventually in time it will increase. Typically though, most babies are introduced solids around 6 months. Making homemade baby food can seem hard to do at first, but with the right tools and knowledge it's really easy! First off you need a good food processor. It doesn't have to be expensive, because there are great cheap blenders out there. When Baby Boo was first born I used a Magic Bullet all the time. It was only $40, which is a great price! 1. Whether it be brown rice, spelt, barley, etc., simply ground it into a flour using your blender. 2. Store in fridge in air tight container. When ready to use, bring a pot of water to a boil (roughly 1/4-1/2 c. cereal to 1 c. water) then add cereal and cook for 10 minutes until soft. Mix in formula, breast milk, etc..then serve when cooled. 2. Steam veggies in a vegetable steamer. (Always steam veggies separately) Once veggie are soft, transfer to a blender or fod processor and puree until smooth. Once cooled serve to baby. 3. You can store extra puree's in the fridge or freezer in an air tight container. I love making baby food, but you don't always have time when your on the go and busy. That's why it's great to puree lots of food and store in the fridge or freezer for those busy days. When in doubt, don't fret because you can use store bought food too. 1. Buy organic and nothing with additives. 2. Use whole grain organic cereals with simple ingredients. The first time a baby taste solid foods, it's definitely an experience. You have to remember that every food you put in front of them is something that have never taste, seen, or experienced. Take it slow with each new food, introducing each one at a time. Introducing foods slowly and one at a time also helps you learn if the baby is sensitive or allergic to certain types of food. -Make your own homemade veggie stock, which can be added to vegetables being pureed. Great way to add extra vitamins and minerals. -Fruit puree combo such as peach and plum, or blueberries and prunes. -Potatoes, parsnips, rutabaga, and carrot puree mixed with a little veggie stock. Ok, on to the next stage! This is the stage where you don't have to puree every single food item, and you can switch to more bite size and chunky foods. Instead of pureed bananas, give your child small cut up bananas. At the beginning of each week I like to cut, wash, and cook a bunch of foods to have on hand through out the week. Having cooked beans in the fridge for easy snacking for your little ones, pre-cut fruits, and pre cut veggies that can be steamed and easily eaten makes your day so much easier. Having these items on hand can also make meal time easier for the adults. When you have cooked beans, rice, and fresh veggies etc. prepared in the fridge it's easier to make a meal. -chopped fruits such as bananas, raspberries, blueberries etc..
-Soft crackers that are easily dissolved when sucked on. I like to make my own from THIS website. There are so many food options when it comes to feeding the babies, and I could have writen a really super long post...But then it would take me longer than a few days to write. :-) These tips are just the basics to get you thinking. Consult your doctor first before giving your baby any types of food, and do your research. I have read tons of baby food books which have truly helped me out early on, and have given me the ideas I have needed! My next post will be toddler food!! I have tons of recipes for that, pictures of food ideas, and well...lot's of messy face pictures! Thanks for your patience during these next few days!